Our goal at Austin Simply Fit to provide the community with the means to achieve a healthy, fit and active lifestyle – no matter what your goals are, no matter how busy you are. That’s why we’re proud to bring our premier total body condition classes to EVERYONE! Austin Simply Fit’s Total Body Conditioning programs are designed to bring out the best in you by letting your inner athlete shine. Participants will work with Austin Simply Fit’s coaches to increase overall fitness through explosive exercises that increase power, agility and overall fitness. This class can be used in addition to your regular workouts or as an additional workout to compliment any athletic training, and you do not need to be an athlete to get the most from it. 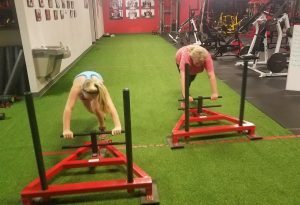 This class is designed to take you through all forms of movement using a variety of equipment and weights in combination with sprints, jump, leaps, and bounds. Specific classes for youth and athletes are available, too. Please contact Mark Rogers to learn more. Are you interested in becoming stronger? Are you interested in being healthier and more active? Are you interested in building more muscle? Are you a parent that needs to let loose? Do you like training in a small group setting? If you answered yes to any of these questions, this class is for you!